We picked the first greens of the season…Yippee, Yahoo! Always a treat to start gathering the baby lettuce for the first yummy salad from the fall crop. Here in the Central Valley we can’t grow lettuce in the summer…well, we but it’s a LOT harder and frankly not worth it. I just buy Earthbound Farms during the months of hell and we eat more zucchini. With temperatures around 110 for days on end it fries the poor greens; ours start bolting when the temp gets into the high 80’s! 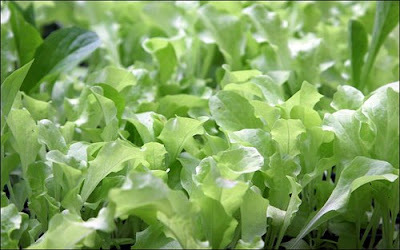 Our climate, however, does allow us to plant lettuce several times from fall thru early spring so we theoretically can have baby greens for 7 months of the year. I tend to be lazy, plant a couple different varieties over the course of a few weeks in Oct. and then eat it all winter at whatever stage it happens to be. This year we are going to experiment with staggered plantings because the young growth is so tasty and we just want to see what happens. I’ll keep you posted on the results. The plan is to plant a small bit on the first of Dec. and then again in Feb. and March….depending on the weather and the soil conditions. My research (aka googling - see tips) says these should germinate at temps as low as 40 degrees at night, 60 during the day…so we’ll be following the weather reports a bit more closely than usual. 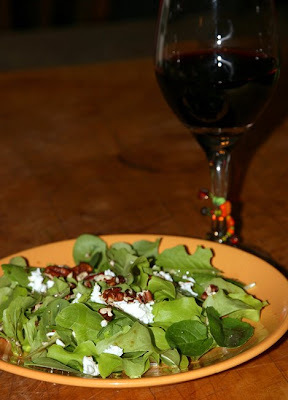 This salad is mostly Black-seeded Simpson, because it grew the fastest, served with goat cheese, pecans and a glass of wine…not optional.